All parents worry about whether their child is developing correctly at the right speed. During the toddler years, you start to really notice significant development changes. It’s important to realize that each child develops at their own pace so there is no strict rule on when they should be doing certain things. 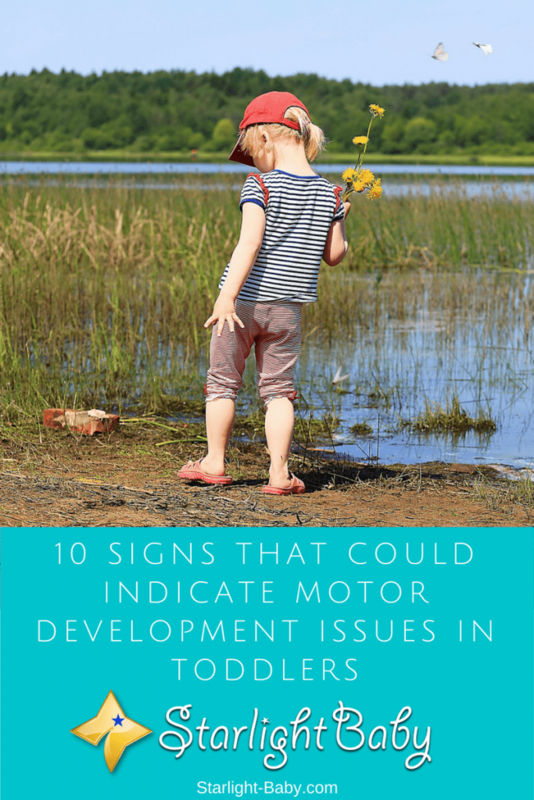 However, there are a few things you can watch out for that could indicate motor development issues. Remember, the 10 signs listed below are a guideline only, and have nothing to do with your parenting skills. If you are concerned, it is highly recommended you seek advice from your pediatrician or health professional. By the age of two, your toddler should be able to use speech for more than just highlighting their needs. They will start to have little conversations with you even though you might not be able to fully understand them. If your little one doesn’t know more than 15 words, or they can only imitate speech rather than initiate it, it could be a sign of speech development issues. If your toddler’s limbs seem a little stiff, it could be a sign of cerebral palsy. Do they have their hands in tight fists a lot or have difficulty moving from one place to another? If so it could be a sign of hypertonia, or high muscle tone as it is commonly known. It may not be an indicator of cerebral palsy but it should be checked out by a doctor just to be sure. Sometimes, toddlers can start to regress a little, suddenly losing the ability to do things they have already mastered. There are certain situations where this is normal however. For example, if you have another baby your toddler may start to ask for diapers again, or a pacifier or bottle. This is likely out of anxiety or simply just copying what baby needs. The times when it isn’t normal include if your toddler loses the ability to crawl, or becomes weaker. In these situations, you should take them to the doctor as soon as possible as it could be an indication that something is seriously wrong. Some of the problems associated with motor skill regression include epilepsy, a brain tumor or cancer. Of course, it may not be something serious so try not to get too worried, but having them checked out quickly is important. When your toddler first learns how to walk, they’ll typically use their toes, rather than having their feet flat on the floor. However, this is usually something that stops once they learn how to walk properly. Occasionally they may do it as a little bit of fun, or as a general habit after the age of two. However, if they use their toes to walk on all of the time, they have trouble with co-ordination or they don’t seem to be able to hold their own weight, there could be a problem. It could be that your toddler’s Achilles tendon is a little short, or it may indicate cerebral palsy. There is also the chance it could be linked to autism or language delay issues. So, as toe walking can be an indication of numerous issues, it’s best to get a proper diagnosis from a doctor if you suspect it isn’t a temporary problem. While all children develop at their own pace, most children should be able to walk by the time they reach 18 months. If they aren’t it may not necessarily be an indication of a problem, but it should be looked into by a doctor. Sometimes baby walkers are to blame, as they can actually slow down your toddler’s walking development. This is because they don’t encourage adequate muscle growth required for toddlers to walk properly. More serious problems it could point to include cerebral palsy or an intellectual disability. As adults, we’re all either left handed or right handed. It’s something that all children develop from a young age and is completely normal. However, if you notice your toddler only uses their left hand for example, and they’re reluctant to use their right hand or seem unable to, this isn’t normal. It could be a sign that your little one has a type of cerebral palsy known as hemiplegia. It’s basically where one side of the body is completely dominant. It’s actually normal for your little one to have one side more dominant than the other but this typically disappears by the age of two. Drooling is something you typically associate with babies, but toddlers do still do it to some degree. If you notice your little one is drooling excessively and they have trouble eating, it could be a sign of an oral-motor disorder. This basically means your toddler isn’t able to control the muscles required for eating and swallowing. It can also be an indicator for a nervous system disorder or a developmental disability. However, a more common cause could be your little one has a sore throat. This would obviously make it more difficult for them to eat and they’ll likely refuse a lot of meals until the throat heals. However, if the problem persists you will need to take them to the doctor. All toddlers are clumsy to some degree. It’s normal for them to fall down a lot and bang in to things as their co-ordination develops. Some toddlers are also a lot more adventurous than others so they are more likely to take a tumble quite frequently. The thing to watch out for is excessive clumsiness. If they walk into walls, or have trouble getting up and down the stairs, it might be worth getting them checked over. Most commonly, excessive clumsiness could be a sign of vision problems. However, it could also pinpoint cerebral palsy, juvenile arthritis or muscular dystrophy. At around 18 months of age, your toddler should have a fairly good grasp reflex. They’ll be able to hold a toothbrush or a spoon for example without dropping it. They should also be able to stack at least four blocks on top of each other. If they can’t, it could that they’re having trouble with their vision, or they may have an intellectual disability. However, these conditions usually cause other symptoms too so if grasping is the only issue your toddler has, it’s unlikely to be anything too serious. Still, it’s better to be sure so if you are concerned, get them assessed by a health professional. Now, obviously toddlers are known for their endless energy levels. It’s completely normal for them to run around the house several times before collapsing with a thud on the floor out of exhaustion! What isn’t considered normal is if a toddler is constantly talking, fidgeting or having involuntary movements. If your toddler appears to be over-active and has a very short attention span, it could be a sign of ADHD (Attention Deficit Disorder). However, it could simply be they have a very active personality, and this isn’t a bad thing. If the problem is more involuntary movement related such as tics and seizures, it is an indicator of a problem with the nervous system. Overall, it can be difficult to establish whether your toddler is developing normally. Most of the time, they are just a little slower to develop and there is nothing to be concerned about. However, nobody knows your child better than you so always follow your gut instinct and get them checked over by a health professional if you are concerned. Parents have the sole responsibility of our childs well-being. We have to make sure of having a baby book. Usually baby books contain the development of our child according to their age. If any case that we think it’s unusual act or manner we have to consult our pediatrician right away so any suspected issues will be resolved as soon as possible. We parents should be keen observer. We should be aware and have the proper knowledge of expected development of our kids in this way they will grow up physically, mentally, socially healthy. Yes, that is true sweetpot81. Parents, especially new parents, should have a baby book or should have a guide that would educate them on a child’s development stages. There are a lot of resources online that could help them regarding this matter. And yes, you’re right, parents should be keen in observing these stages so they will know if something might be off. I have an 11 months old baby boy and thankfully, he shows none these symptoms. However, this does not mean he is perfectly safe. He might show these symptoms later in life. I was unaware of most of the conditions explained here. Since kids cannot explain what’s happening to them, we as a parent have the responsibility to check what ails them. We need to study the diseases common in childhood and how to treat these diseases. It’s really difficult when children become sick, vinaya, because as you’ve said, they’re unable to tell us what they’re feeling or what pains them. We have to be very keen in observing them so we’ll know where they feel pain, or what seems to be unusual with them. If something doesn’t seem right, consulting a doctor would always be the best option.